Right at the heart of the Port Orleans Riverside resort lies the 3½ acre Ol’ Man Island. This secluded, lushly wooded island is easily accessed from the various accommodation buildings via three wooden bridges and is home to many of the resort’s recreational activities, including the main feature swimming pool, children’s playground and fishing hole. Down by the levee, just over the bridge lies Ol’ Man Island, full of water adventure. It’s an old fashioned “Swimmin’ Hole” with a large, rustic water slide fashioned after an old saw mill and built into the mill works. The main feature pool at Riverside is a fun swimming area with waterfalls to duck under and a curved slide to hurtle down, along with sun beds and a pool bar for the adult aprés-swim time. There is also a separate shallow children’s pool and a jacuzzi hot tub right next to the main pool area. The Ol’ Man Island swimming pool and the Muddy Rivers bar reopened on 5th March 2016 after a two-month refurbishment project. Poolside activities are organised daily, weather permitting. A full schedule is posted at the resort and a printed copy should be also provided in your welcome pack — or for this month’s details, please see the Recreation Activities Schedule page. The main feature swimming pool on Ol’ Man Island at Port Orleans Riverside. Opening hours: 9am—11pm, reduced off-season (e.g. 10am—8pm during Jan/Feb), see Recreation Activities Schedule page for current hours. Note: The Feature Pool opening hours are now enforced, and the area is gated and locked at all other times. The Muddy Rivers pool bar is open from 11:30am until 9:30pm (varies seasonally) and serves a variety of alcoholic and non-alcoholic drinks and hot and cold snacks. It features a pleasant shaded seating area in clear sight of the main pool. The Ol’ Man Island area also features various other recreational activities such as Cane Pole Fishing, a evening storytelling sessions round an open campfire and a children’s play area, now with a tetherball game added. For more information on these facilities, please refer to the general Recreation page. 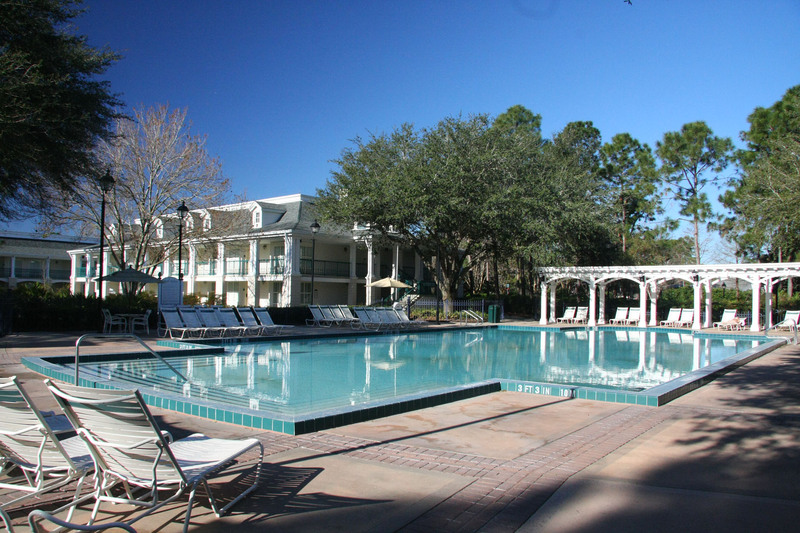 As Port Orleans Riverside is such a large resort, in addition to the main feature pool on Ol’ Man Island there are also five smaller “quiet” leisure pools dotted around the grounds — two in the Magnolia Bend mansion building area and three in the Alligator Bayou section. Each of these leisure pools also features a Laundry Room with guest-operated washing and drying facilities — your laundry can be taking care of itself while you take a refreshing dip in the pool. There are 8 washers and 12 dryers in each of the Alligator Bayou rooms, while the Magnolia Bends rooms have 10 washers and 16 dryers each. Note: as from April 2015, the machines at Port Orleans now ONLY accept credit/debit cards — you cannot use cash, nor can you pay using a Magic Band. The cost is $3.00 per washing load and another $3.00 for drying (prices last verified January 2016). The new machines are now also internet connected. Yes, really! You can check on the current status of any of the washers and driers at Port Orleans via the website www.laundryview.com/disneyworld/ using either a computer or a mobile device, which allows you check for available machines and also to see when your own load has finished. Port Orleans Riverside, Leisure Pool near building 38.